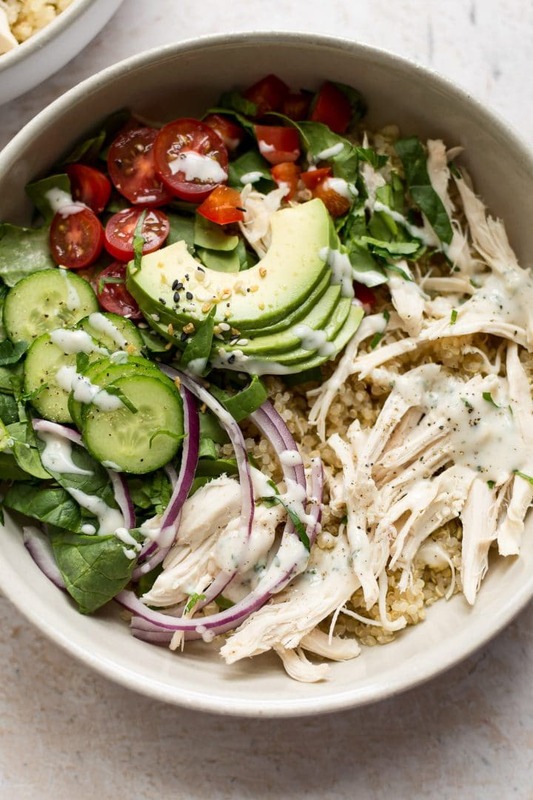 I’ve found that ranch goes well as a chicken quinoa salad dressing. It’s hearty enough that it doesn’t get lost, and we don’t have any delicate greens in here that will get weighed down. For the ranch dressing, you can either use a homemade version (try my homemade ranch recipe) or just use the bottled kind. I do generally prefer the homemade variety myself, but those Hidden Valley Ranch packets are dangerous. I just love that stuff OMG. As always, with salad recipes like this one, it’s very easy to substitute what you don’t like with something else. I hope this recipe gives you some ideas even if you don’t make it exactly as I do. Ranch dressing (my recipe is linked) or use my chipotle ranch dressing if you want some kick! Like quinoa salad? Try my Thai quinoa salad or my Mediterranean quinoa salad. 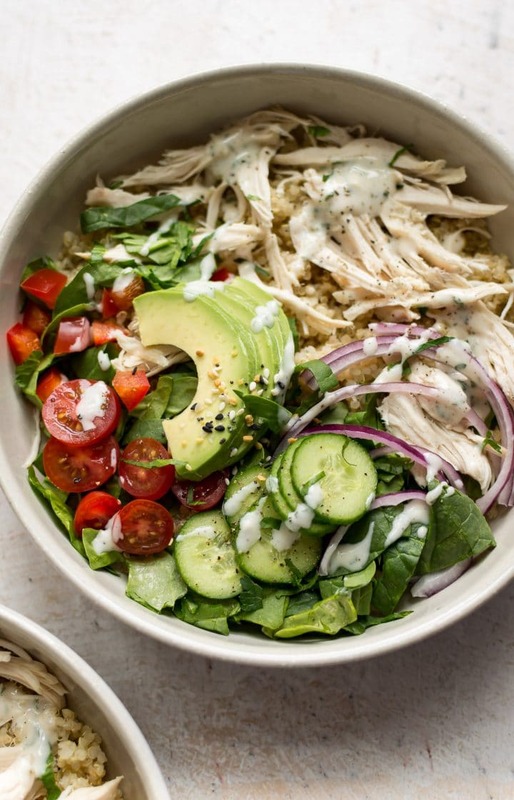 Will you make this easy chicken quinoa salad recipe? Cook your quinoa according to package directions. If making the ranch dressing, make it while the quinoa is cooking/cooling. Here's my recipe. Meanwhile, prep your other ingredients. Feel free to use what you have on-hand and to adjust quantities as needed to suit your personal tastes. 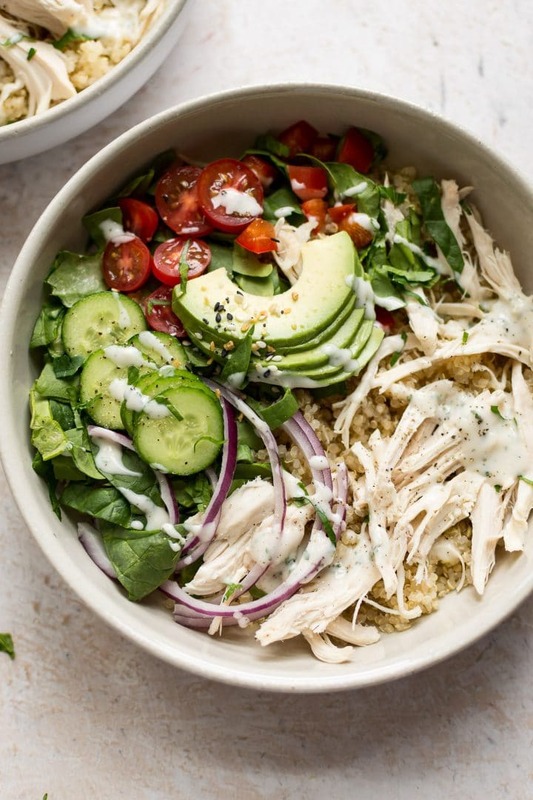 Once the quinoa has cooled, assemble the salad and toss with the dressing. I list prep time as 10 minutes because I continue to prep while the quinoa is cooking so I count it in there. Prep will really depend on if you're making the ranch dressing or using bottled and how quick you are at getting the other ingredients ready. If you need to make this in a hurry, I suggest cooking and cooling the quinoa ahead of time. If you want to make this salad ahead (e.g. for meal prep), I suggest adding the avocado and dressing just prior to serving. 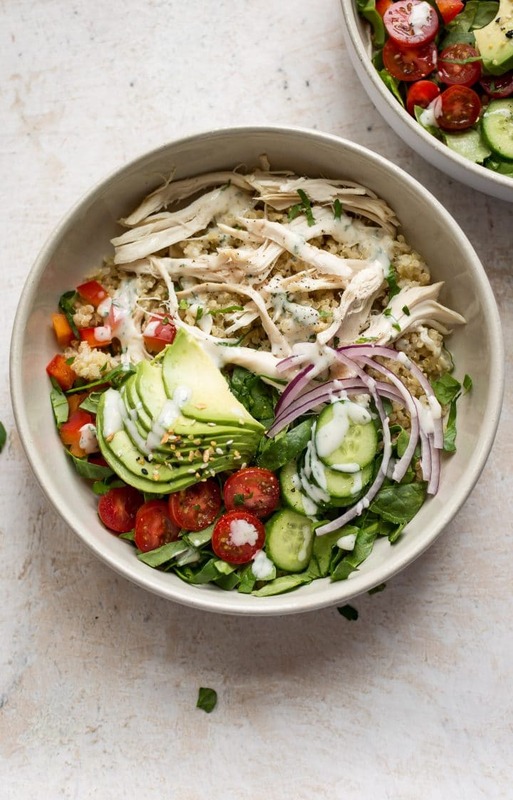 Hi, my husband loves quinoa, so I am always looking for new ways to cook with it. Can’t wait to try this.